Losing your hair when you're young can be especially traumatic. It's bad enough going bald when you're middle aged, but at least by that stage in life you're likely to have peers who are facing the same problem. Young people with hair loss face much more difficult social issues and can suffer intense damage to their self-esteem. What can be done to counteract this? If you're young and you're losing your hair, it's natural to feel isolated. Support groups won't always help because you may find that there are few other people of your age there. Fortunately, the presence of internet groups now makes it easier to find people with similar experiences who can understand what you are going through. Sometimes the problem can be made worse by other people trying to help, especially if they claim to know what your experience is like when theirs is really very different. If you feel embarrassed by your situation, you may prefer not to talk about it at all. It's better to be firm about this and risk hurting people's feelings than let yourself get worn down by trying to be patient. People who really want to help will respect your decision. Because young people are a lot more inclined to be cruel and to say the first things that pop into their heads, bullying can be a big problem. The primary cause of hair loss in young people is serious illness, which means that the victims of this kind of abuse will often feel too run-down and exhausted to stand up for themselves, making the problem worse. Because of this, it's important deal with the problem of bullying as soon as it emerges. The more confident a young person seems about their hair loss, the less they are likely to be picked on. This means that a decisive Change Of Appearance, taking off all the hair, is often better than letting it gradually grow thinner. Wigs And Toupees are particularly likely to attract ridicule because they can give the impression that the wearer is ashamed. Although we might primarily associate bullying with schools, it can also happen in the workplace and in social environments. Authority figures need to take a firm line if they see it happening, but it's most important that the young person themselves has the social skills and the support to be assertive. Whilst older people dealing with hair loss can suffer problems with self image, for young people these are often more serious, as this is a stage in life when it's really important to be attractive. There's a big social focus on flirting and finding relationships, and people with unconventional appearances may suffer ongoing rejection. The good news is that it's now easier than ever to be young and bald. If you have a little bit of hair left, the ghost of stubble can give the impression that you have shaved your head as a deliberate statement of style. If you find it hard to be accepted in mainstream social circles, there are many subcultures where you can socialise without standing out, so look around and find one that works for you. Losing your hair needn't mean that you cease to be attractive. It may limit the number of people who take an interest in you, but you can see it as a filter for getting rid of shallow people who would be likely to bore or offend you in the long term anyway. It can be frustrating not to be able to get attention from the people you really fancy, but you don't need to worry about being single forever. Above all, it's important to remember that losing your hair is your business, not anybody else's. Don't let other people tell you how to think and feel. Baldness doesn't define your identity – you do. 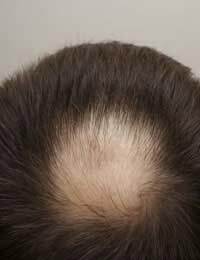 Read our article Bald And Proud to find more ways to boost your self-esteem.